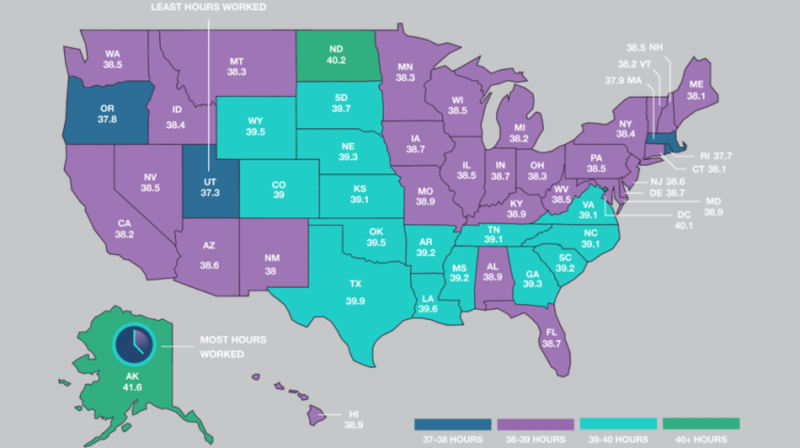 Americans work more hours than other industrial nations, but which states in the country work the longest hours? A new research from Business.org has revealed the states that put in the most and least hours on the job every week. The hours between the most and least hours is just a little over four hours, which brings the national average to 38.8 hours per week. This is still slightly lower than the traditional 40 hour week most Americans work. 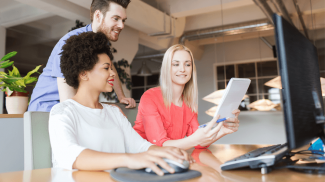 For small business owners, who are notorious for putting in much more than 40 hours, the data in the research can provide insight into how much the people in their state work. 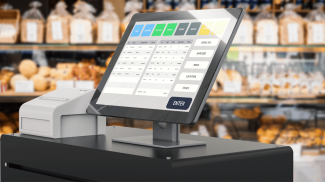 The information can be used by companies to deliver more accurate products and services related to specific industries and labor. 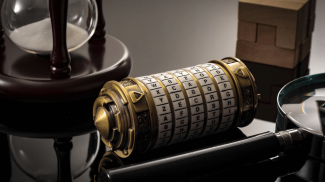 The data for the research came from the U.S. Census Bureau. Business.org looked at men and women from the age of 16 to 64 who worked full and part-time positions in the past 12 months. 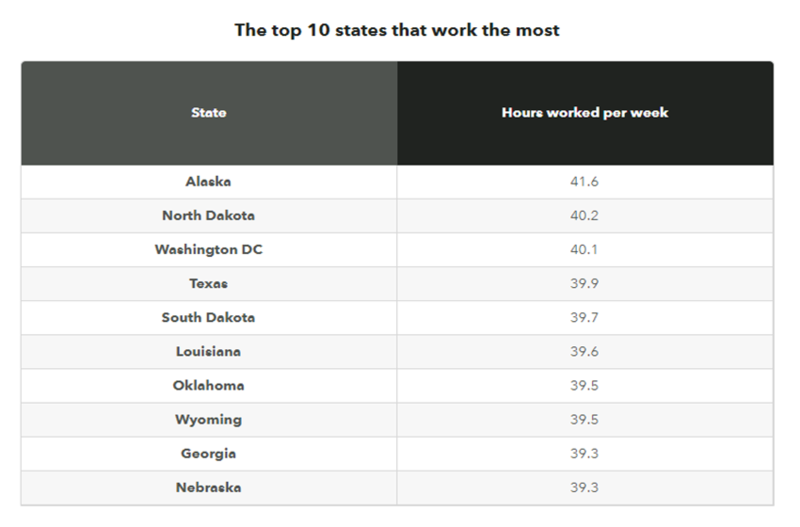 The state that put in the most hours was Alaska with an average of 41.6 hours per week. Business.org attributed the long hours to the oil and gas industry. Not surprisingly most of the top 10 states are among the top crude oil producers in the US. The men in Alaska also clocked in the most time at 44.5 hours, with Washington D.C. coming in number one for women at 38.9 hours per week. 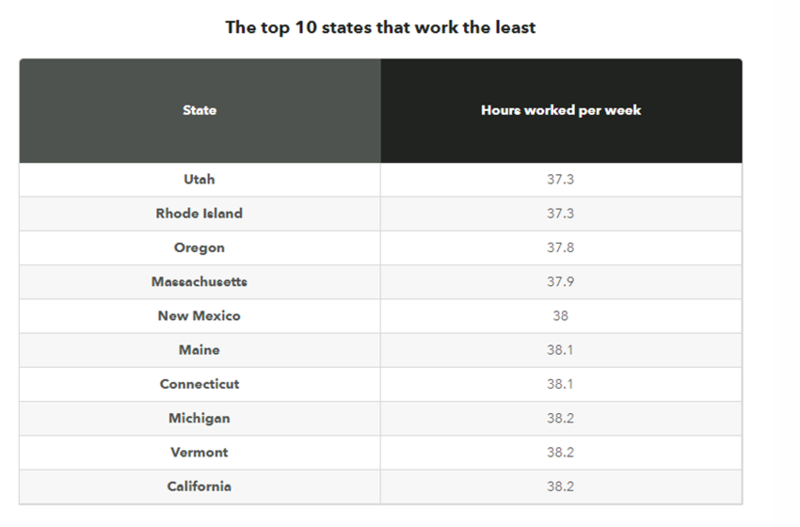 The state with the least hours was Utah with an average of 37.3 hours. The men in the state worked 40.6 hours, while women put in 33.2 hours each week. Utah has a strong culture which emphasizes family, Business.org says this may be one of the reasons it has the lowest hours in the country. Across the board, women worked fewer hours than men, and they also held more part-time positions. When it comes to the gender gap, North Dakota was first. Men in this state worked 7.7 hours more than women with a 43.7 to 36-hour difference. Utah had the second largest gap at 7.4 hours, with men working 40.6 hours per week and women at 33.2 hours.